Lutherville is a census-designated place (CDP) in Baltimore County, Maryland, United States. As of the 2010 census it had a population of 6,504. Prior to 2010 the area was part of the Lutherville-Timonium CDP. Within its borders lies the Lutherville Historic District. According to the United States Census Bureau, the CDP had a total area of 2.1 square miles (5.5 km2), all of it land. The town is located north of Baltimore City along York Road (Maryland Route 45). It is bordered on the north by Timonium, on the west by Interstate 83, on the south by Towson, and on the east by the Hampton neighborhood. The boundary between Lutherville and Timonium is Ridgely Road. Lutherville is located in the Piedmont region of the United States, and lies in the Humid subtropical climate zone, with hot and humid summers leading into winters that are chilly but not extreme by American standards. The average annual snowfall is 25 inches (64 cm) and average annual rainfall is 42 inches (107 cm). As of the 2010 census, there were 37,732 people, 15,562 households, 9,875 residing in the CDP. The racial makeup of the CDP is 87.0% White, 3.3% African-American, 0.03% Native American, 8.1% Asian, and 1.57% Hispanic. The Maryland Transit Administration‘s light rail line serves the community with the Lutherville Light Rail Stop. In addition, bus routes 8 and 9 provide regular service along the York Road corridor, meeting at the Lutherville Light Rail Stop. There is also a limited amount of bus service on Bus Route 12 along Dulaney Valley Road to Stella Maris Hospice. The MTA light rail line uses the right-of-way of the old Northern Central Railway (later, part of the extensive Pennsylvania Railroad system). During the Civil War, President Abraham Lincoln travelled through Lutherville on this railroad en route to Gettysburg, Pennsylvania, to deliver the Gettysburg Address on November 19, 1863. Less than two years later, on April 21, 1865, Lincoln’s funeral train also passed through Lutherville on its way fromWashington, D.C. to his final resting place at Springfield, Illinois. The Pennsylvania Railroad (PRR) operated long-distance passenger trains from Baltimore over the line to Chicago, St. Louis, and Buffalo as late as the 1960s. The former PRR Lutherville freight and passenger station on Railroad Avenue is now a private residence. 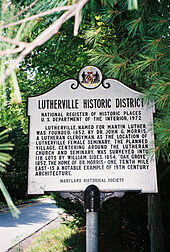 The oldest section of Lutherville dates back to 1852, when it was founded by two Lutheran ministers as a planned community, anchored by a Lutheran seminary and church. The land was originally part of the vast Hampton Estate of Charles Ridgely, from whom it was purchased in 1851. The two ministers, John Kurtz and John Morris, named the community after the 16th-century German reformer Martin Luther. The Lutherville Female Seminary, as it was initially called when chartered in 1853, was built near the tracks of the Baltimore & Susquehanna Railroad, a forerunner of the Northern Central Railway. In 1895, the institution was renamed the Maryland College for Women. Following a devastating fire in 1911, the college was rebuilt and continued in operation until 1952. Its campus is now an adult congregate living facility, College Manor. St. Paul’s Lutheran Church, started in 1856 by John Morris. The present stone sanctuary was built in 1898. St. John’s Methodist Church, built in 1869. Octagon house on Kurtz Avenue, built of concrete in 1855 by another Lutheran minister who also served as the town’s postmaster.